Having elected to bat first Windies batted better than what they’d in the first Test and put up a competitive total of 311. India’s first innings was marked by a quick-fire 70 from Prithvi Shaw, an attritional 80 from Ajinkya Rahane and a 92 from Rishabh Pant. Often termed as the moving day of a Test match, the third day of the second Test eventually turned out to be the final day of the match. 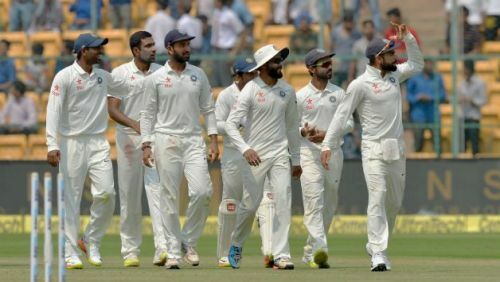 India was only able to achieve a paltry lead of 56 runs after ending up on 308/4 on day twp. Jason Holder, the Windies skipper took a five-wicket haul as both Rahane and Pant failed to register a century. Windies batting unit once again crumbled and was bundled out of 127. Umesh Yadav was the standout performer for India as he took 10-wickets in the match registering his career-best figures of 10/133. India chased down the target of 72 and registered a comfortable victory to win the series 2–0. A careful vigil from Ajinkya Rahane and a patient innings to the standards of Rishabh Pant was ended by Jason Holder as he moved the new ball both ways. Rahane was surprised by the bounce of the ball and nicked one to gully. Pant fell prey to a good catch by Shimron Hetmyer soon after Ravindra Jadeja was trapped leg before wicket. Kuldeep Yadav was the final victim of Holder. With a struggling Lokesh Rahul and both Prithvi Shaw, Mayank Agarwal being fairly new to the international set-up, most of the responsibility will rely on Chetheshwar Pujara and Ajinkya Rahane. Although Pujara scored 86 in the first match and Rahane scored 80 in this innings, neither of them have had a marathon inning that could’ve boosted their confidence. The trio of Mitchell Starc, Pat Cummins, Josh Hazlewood along with Nathan Lyon might be too hot to handle for the Indian middle-order veterans.